BEIRUT (Reuters) - The U.S.-backed Syrian Democratic Forces (SDF) have seized ground from Islamic State in a fierce battle to capture its last enclave in eastern Syria, an SDF official said on Sunday. The SDF, backed by a U.S.-led coalition, began the assault on Saturday, seeking to wipe out the last remnants of the jihadist group's "caliphate" in the SDF's area of operations in eastern and northern Syria. The enclave is close to the Iraqi border and comprises two villages. Islamic State (IS) also still retains territory in the part of Syria that is mostly under the control of the Russian- and Iranian-backed Syrian government. 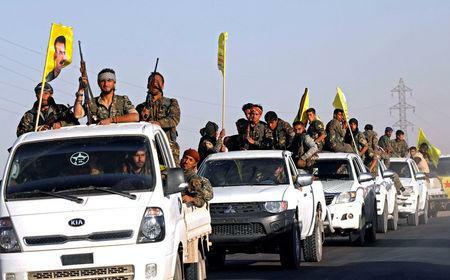 SDF fighters had so far seized 41 positions but had faced counter attacks early on Sunday that had been repelled, Mustafa Bali, head of the SDF media office, told Reuters. "The clashes are ferocious naturally because the terrorist group is defending its last stronghold." President Donald Trump, who is planning to pull U.S. forces out of Syria, said on Wednesday he expected a formal announcement as early as this week that the coalition had reclaimed all the territory previously held by Islamic State. Bali said 400 to 600 jihadists were estimated to be holed up in the enclave, including foreigners and other hardened fighters. Between 500 to 1,000 civilians are also estimated to be inside, Bali said. More than 20,000 civilians were evacuated in the 10 days leading up to Saturday, he said. "If we can, in a short time frame, get the (remaining) civilians out or isolate them, I believe that the coming few days will witness the military end of the terrorist organization in this area," Bali said. Senior SDF official Redur Xelil told Reuters on Saturday the force hoped to capture the area by the end of February, but cautioned that IS would continue to pose "great and serious" security threats even after that. IS redrew the map of the Middle East in 2014 when it declared a caliphate across large areas of Syria and Iraq. But it steadily lost ground and its two main prizes - the Syrian city of Raqqa and Iraq's Mosul - fell in 2017. Spearheaded by the Kurdish YPG militia, the SDF has been the main U.S. partner in Syria. A top U.S. general said last week Islamic State would pose an enduring threat following the U.S. withdrawal, as it still has leaders, fighters, facilitators and resources.